Welcome to the Carolina Gold Chapter, NSDAR website! The National Society Daughters of the American Revolution (NSDAR or DAR) is a non-profit, non-political, volunteer women’s service organization. 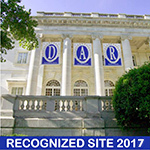 Founded on 11 October 1890, the DAR now has more than 3000 chapters across the United States and internationally. The Carolina Gold Chapter was chartered on 5 December 2015.